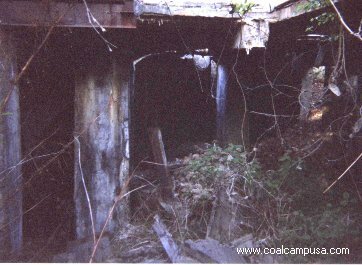 This was once a nice coal camp constructed between 1920 and 1922 by the Raleigh-Wyoming Mining Company. 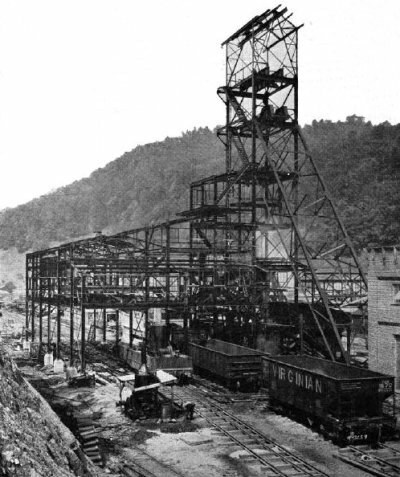 When construction commenced the Virginian Railway had not yet built a branch to the the new mine, so building materials were brought in on an existing narrow gauge logging railroad. Glen Rogers was named after the founder of the Virginia Railway - Henry H. Rogers - and the first car of coal was shipped in June 1922. 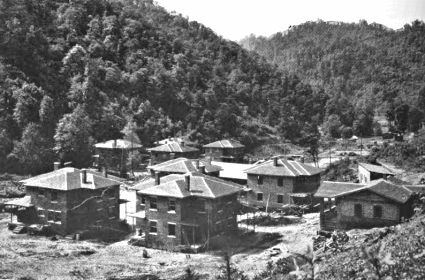 A 1922 issue of The Black Diamond magazine states that "the town that was planned to be there when the last of the 70,000,000 tons of coal has been shipped, is to be a model community and more of a mountain resort than the average idea of a mining camp." 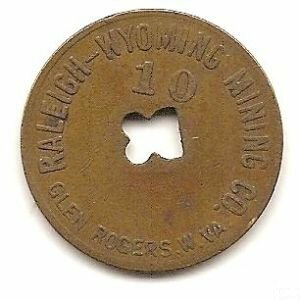 The high water mark of production was 955,000 tons in 1940, and for a time it was the biggest coal producer on the Virginian Railway. 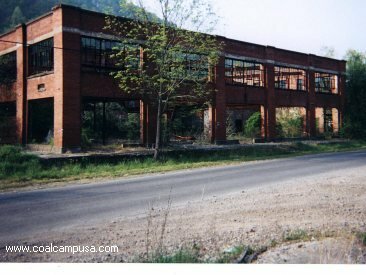 The mine closed and the company went bankrupt in 1960. It has been reduced from its former grandeur to the state you see in these photos. 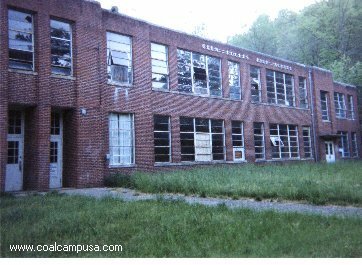 Now Glen Rogers is nearly a ghost town - and it's been sold like a used car. 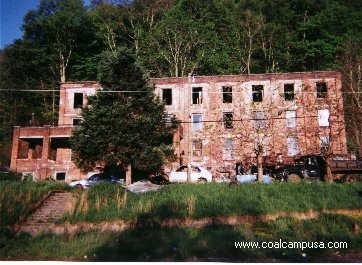 In May, with the mine closed for five years, the town was sold by the bankrupt Wyoming Pocahontas Coal & Coke Co. to the Youghiogheny and Ohio Coal Co. Nature is reclaiming its own here. 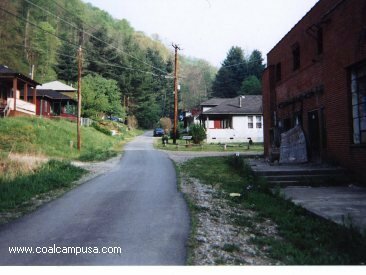 I drove to Glen Rogers, through the angular, forested mountains of southern West Virginia, to see a town dying. My first impression was the melancholy quiet. The only life visible was two old men chatting in the shade of the abandoned company store and office building. Behind them the screen doors hung lopsided from one hinge. Most of the houses are deserted and the windows gape jaggedly where they were smashed. Weeds and vines grow everywhere and twine in the rotting carcasses of abandoned trucks and cars. 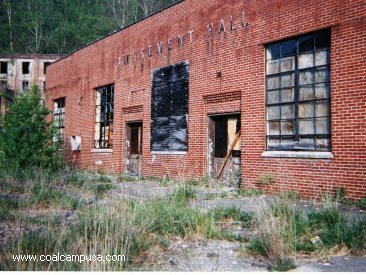 The town has a central square with three solid brick buildings - the store building, a "recreational hall" housing a deserted movie theatre, barber shop and pool hall; and a "clubhouse" where unmarried miners once boarded. I looked through a grimy window into the old company office. Dusty papers littered the floor and the big safe - which one held payrolls for more than 1000 miners - gaped open. Next to the square is the minehead. The tipple, rails, power plant and machine shop have all been gutted for scrap. The power plant's concrete smokestack towers coldly over the rusted remains like a monument to the once-proud mine - largest on the Virginian Railway - which had a peak production of 8000 tons a day. The first person I met in Glen Rogers was Postmaster Hayden Wolfe. Outside the post office in the recreation building the American flag hung over an old sign saying "beauty parlor." Mr. Wolfe worked in the mine for 25 years until he was forced to retire in 1954 by a miner's nemisis - silicosis [Black Lung]. "I took a census yesterday," he told me, "and came up with 275 people. Last year it was a real ghost town when only about 75 were left." Mr. Wolfe explained that since then some people had taken advantage of the new company's offer to sell houses at low prices and had come to Glen Rogers. He said they were mostly retired or on relief. "It was a real pretty community," he said. 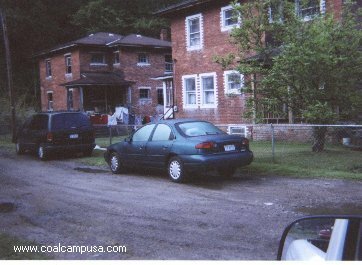 "Even though they didn't own it, people took care of their property. I swear we had the best hearted people you ever saw. Coal miners are strange. No matter how much money they make they are always short. But if someone got burnt out or injured we never had any trouble passing around and raising seven, eight hundred dollars for them. I'll tell you a strange thing. 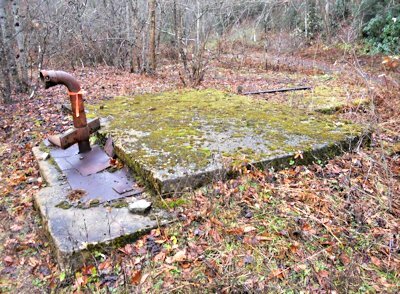 People who left when the mine closed always come back, just for visits, maybe from New Jersey or Washington, but they come back. There is something about the town." The town government of Glen Rogers is all wrapped up in the burly figure of Walter Brooks, who looks out for the interests of the town's new owners. 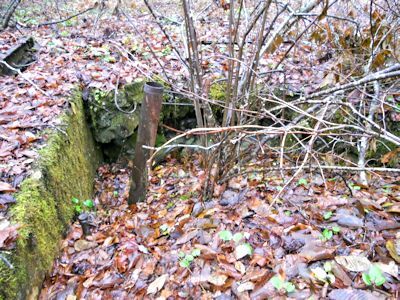 Mr. Brooks, a former mine superintendent, was appointed court trustee when the mining company went into bankruptcy in 1960, and was hired to watch over Glen Rogers by the Youghiogheny and Ohio Coal Co. when it bought the town. I asked Mr. Brooks why the mine closed. "It shouldn't have. There is no finer coal in the world and there is plenty of it down there." [This coal was probably later mined by Maple Meadows.] "The company just didn't keep up with the times. They used second-hand equipment and there were too many breakdowns and productivity was too low. They started to put in new equipment at the end but it was too late." Mr. Brooks is pessimistic about any future for Glen Rogers. He said the present owners bought the town and mineral rights to 29,000 acres around as "a reserve." "But there won't be anything happening here. Not in my lifetime anyway. For one thing the mine is flooded. There's water up to within 50 feet of the top of the shaft." I took a last tour around before driving out of Glen Rogers. All over, as if nature were trying to cover up the decay, grew thick patches of vivid wild pink roses. 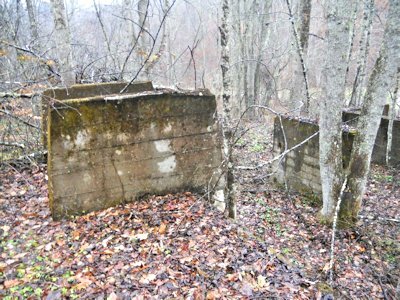 A few raggedy children played by the tracks which had carried gondola cars loaded with millions of tons of Glen Rogers coal. Otherwise the town was quiet, a ghost passively accepting the return to wilderness.